Has the world around you gotten surreal lately? Do you think you recently witnessed an episode of the Twilight Zone when Trump groveled in front of Putin during the so-called Helsinki Summit? Do you have the feeling that you've crossed into another dimension when you read Trump's tweets? Do Trump's daily lies make you dizzy? Having trouble shaking off the feeling we're caught in a demonic reality show? Confused why Trump is saying the Russians are going to attack Republicans in the midterms, despite the complete consensus from our intelligence community, and Congress, that they helped Trump in the 2016 elections? Don't feel bad. Others feel like you do. 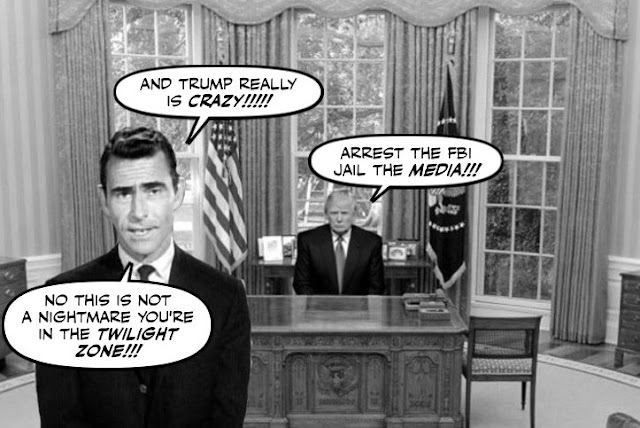 Each day under the Trump regime is like opening a new door - or episode - into an alternate universe. We're all forced to take a stroll in Trump's world everyday, because he's sitting in the Oval Office. That doesn't mean we have to be ostriches like Trump's supporters, and keep our heads buried in the fake reality show he's starring in right now.